Meet Evelina Mayner, owner of the Baltic Art Studio and Featured Business Owner at SCORE Chicago this week. Learn how she started her business and what tips has for your success. Baltic Art Studio offers handmade glass art for home decor or commercial interiors. We also give fused glass workshops and parties for you and your friends. I want people to feel beauty, to be surrounded by beauty which improves the quality of everyday life. That’s why I create art. And I want to share the process. I want people to touch the material, to see the process from sketch to finished piece. I come from an artistic tradition. My dad and I worked on panels and windows for chuches, public building and private collections. I’ve worked as a professional glass restorer. I’m a serious professional artist. 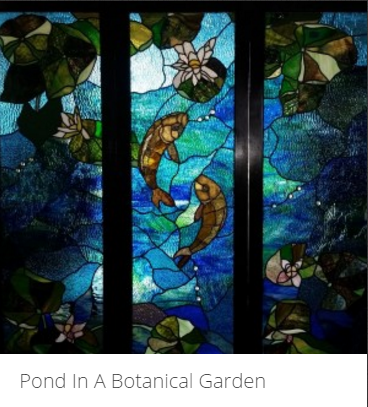 Our clients are interior designers, developers and homeowners who want to add glass panels or glass art to their properties, or have glass sculpture in their homes. We also create custom pieces for them. 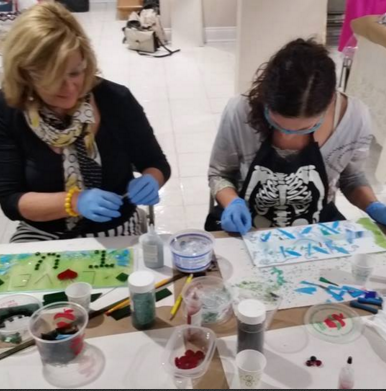 In addition, we provide fused glass parties and classes for anyone who wants to learn. Marketing is my biggest challenge — to figure out how to reach various segments of my market and get them to buy. Who are your Mentors and how they have helped you in your business? Mitch Morris and Peg Corwin are my SCORE mentors. Mitch encouraged me and told me what to do, step by step. Peg helped me improve my website and introduced to me to various online marketing techniques. You must have a lot of patience and courage to be an entrepreneur. Sometimes you think you can’t do something but you just need to get up and do it.